Veneers are very thin shells – made of porcelain – placed onto the tooth surface. 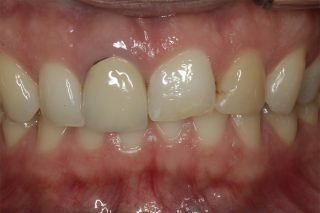 Thus oddly shaped, unevenly spaced or malpositioned and discoloured or stained teeth can be easily corrected. Even chipped edges can be made invisible. These shells are thin like fingernails (0,2 to 0,3 mm). Your advantage: Much less of the dental substance has to be removed compared to ceramic crowns. To accommodate the small thickness of veneers and to place them perfectly and precisely, without protruding, a very small amount of dental enamel has to be removed. Our master dental technician then constructs the veneers in the laboratory, considering all your wishes, how your smile should look like. 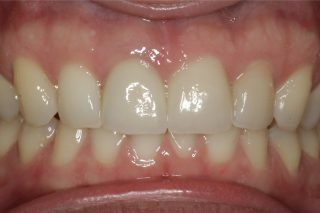 To protect your teeth and for aesthetic reasons, you will get a perfectly fitted provisional solution until your veneers are ready to be placed. The result will astound you! You are welcome to arrange an appointment with us to see, if you are an eligible patient for veneers and to find the best solution for your problems.